If you clicked on this post then chances are your house is Frozen obsessed too! We love Frozen, all things Frozen. My daughter’s birthday isn’t ’til August but I have been planning for a while. Recently she has wanted a Un-Birthday party so what better excuse to try out a cake? (That and a neighbor wanted a cake for her daughter. I agreed as long as she shared it with my daughter for her un-birthday.) 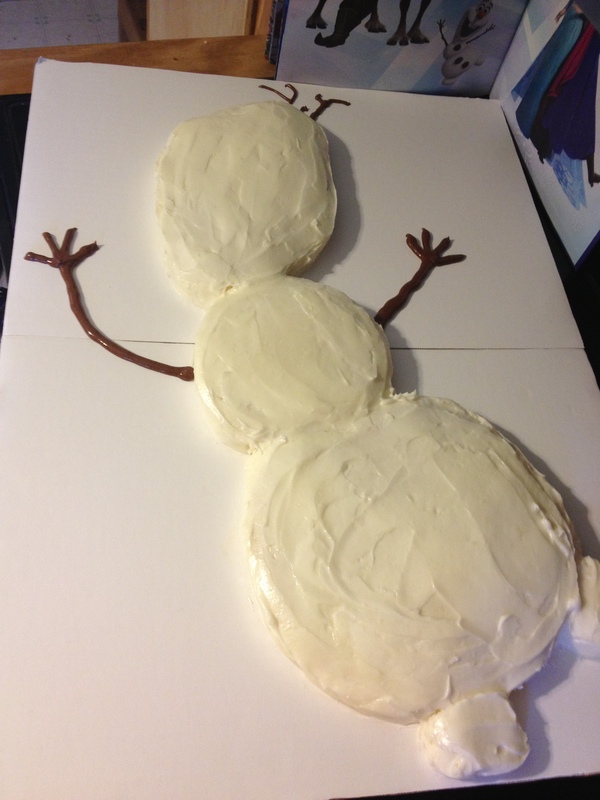 We decided to make Olaf since he is a favorite of ours. I started off by baking my 2 9″ cakes first. Once they were done and cooling I put in the 13×9 cake. Once they are cooled off a bit I put them in the freezer on a piece of cardboard so they harden. After a few hours I started with the round pans again. Take one and using the cake pan cut of small chunk. Like a small semi circle for the bottom base. Take the other cake and cut a smaller circle for the middle part. I used a top from a sauce pan. Then the middle will fit in the semi circle to make up the body. For the head I printed out this image. I enlarged it using Microsoft Word to make it the size of the page basically. Once printed I cut it out and traced it onto a piece of cardboard. Then cut out the cardboard. Next get the 13×9 cake and place the cardboard on top. Using a sharp knife cut around the cardboard to get desired shape. (Keep the scraps to cut out nubs for his feet) Now put back in the freezer. To start icing remove one piece at a time and dirty ice them. Basically just lightly ice and catch all the crumbs. Then put them back in the freezer and do the rest. 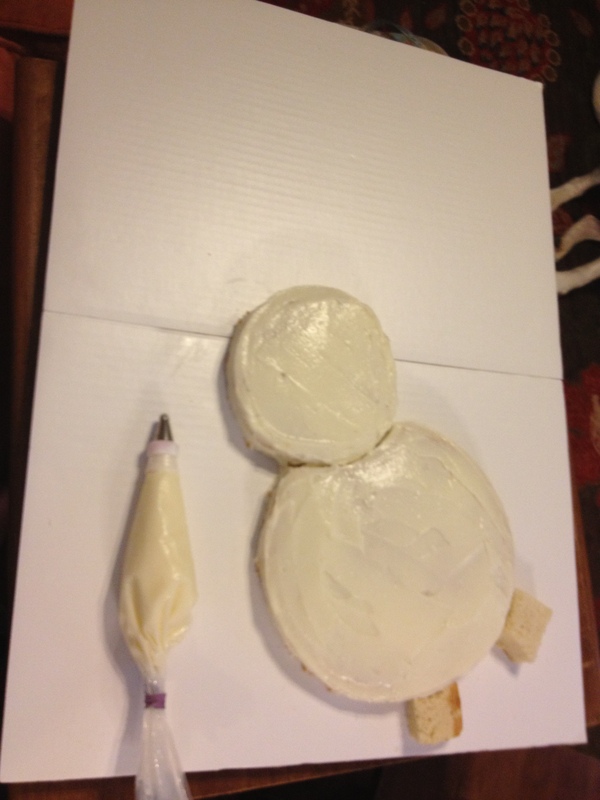 After a couple of hours, get your cake board and put the body together as desired. (I used a grill spatula to place the dirty iced pieces) I placed mine similar to image above so his body is a little catawampus. Plus you need to turn them a bit to fit on the board. I used cream cheese icing to spread but if you want to star tip then use regular icing. I iced the 2 body pieces and then got the head and feet from the freezer and did those also. Now that the base is done we move on to the arms and hair. I used royal icing from here on out. I took some and mixed it with cocoa powder to make a great brown. Using a Wilton #10 tip I piped out the arms, hands and hair. Next I lightly traced out the eyebrows using a toothpick and filled those in with black royal icing using a Wilton #5 tip for all outlines. For round eyes I actually used my salt shaker and gently pressed it on the cake. It made a circle indention and then I piped the edge. Same with inner circle. I used the top to my toothpick holder and piped out the edge and filled it in. (Once the black is dry I went back in and filled the middle in with white icing.) Then also with a toothpick I moved down and traced out the mouth. Trace out a section for his teeth as well. Fill in the other part with black icing and let harden then finish his teeth with white. Move down to his buttons and just have fun. They are meant to be misshapen so it’s hard to mess them up. All that is left is his nose. I used a carrot and iced it. Bad Idea! Learn from my mistake and just use a carrot. All the icing fell off and made a mess. Looked fine with no icing. Just get a slightly bulbous carrot and carve down as needed. I added that right before serving and here is the finished product. Thank you for this! I made it for my daughter’s birthday and went with your suggestion of using a real carrot (I used 2 mini carrots held together w/a toothpick in the middle). Also, for his buttons I used Oreos, and for his arms & hair I used chocolate Twizzlers- it was a big hit! did you dirty ice them with your cream cheese frosting or another kind? did you take the cakes out of the pans before or after you freezed them? any tricks to get them out of the pans in one piece? Ohhh my. Thankyou so much for your post and all your helpful hints and tips. You have done a fantasic job. This will be such a great project for my granddaughters birthday cake. Like many she loves everything frozen. I think i should be able to do this for her, wirh you help. So once again thankyou so much. Thank you for the kind words and good luck!! Post pictures if you can! Happy Birthday to your granddaughter.